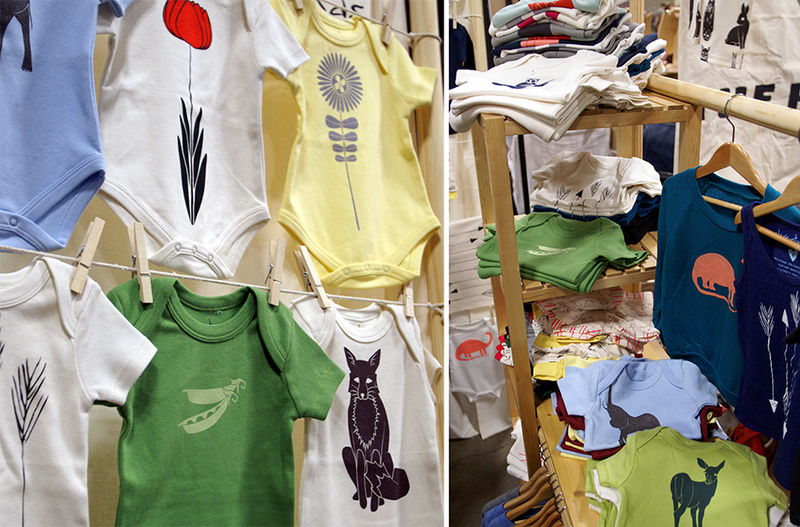 Cute, Hand Printed Eco-Conscious Clothing for Kids. 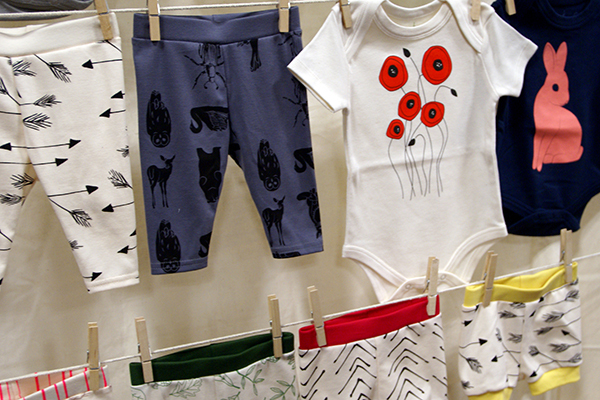 Playful Patterns & Designs Made for Fun & Comfort. There's something really special about a local handmade brand that can make you want something like baby clothes when don't even have children. 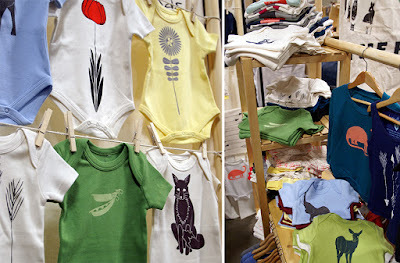 Jess Wells of Eleventy Five has harnessed this power with her hand sewn and hand printed clothing for kids. Her designs are so cute that it's hard to walk by her booth at an art event without racking my brain for who I know with kids that I could dress up in a custom onesie or little patterned shorts. Jess is passionate about both the designs and the materials she uses. She is mindful of comfort and environmental consciousness in selecting the only best cotton and water based inks for her creations. Your kids will not only look amazing, but they should feel good too in one of her onesies, baby baseball tees, leggings and more. The challenge with Eleventy Five is picking your favorite print. 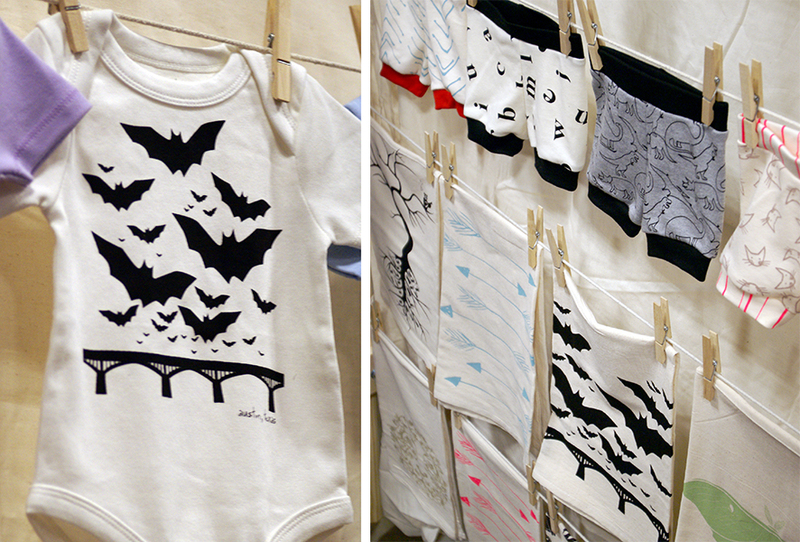 Jess comes up with so many adorable patterns from animals to geometry to a line of punny foods, that she silk screens by hand. For you fellow Austinites, she has a lovely bat and Congress bridge design that seem quintessential for the locally born and raised. 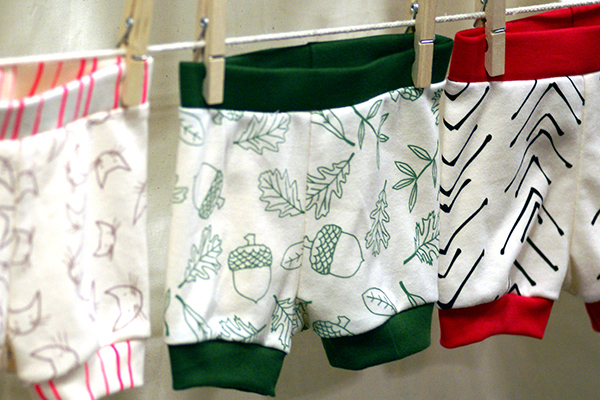 And if you want to make your own clothing, Jess now offers her patterned fabric on Spoonflower. The word cute doesn't fully capture the essence of Eleventy Five. I have Jess at the top of my list for gifts as soon as I hear about a friend who's expecting. She's always adding new prints, so it's such fun to check out the latest options. Cheers to making me want to buy all the onesies for children I don't have yet!